Olympia the capital of Washington state. As you might guess, I’m talking about Washington state climate legislation. We’re going to start with the bills highlighted at Climate Lobby Day in Olympia on Jan 22nd 2018. It was hosted by Audubon Washington, Climate Solutions, CarbonWA, Washington Women CAN. Note that CarbonWA is now part of ACT Now. 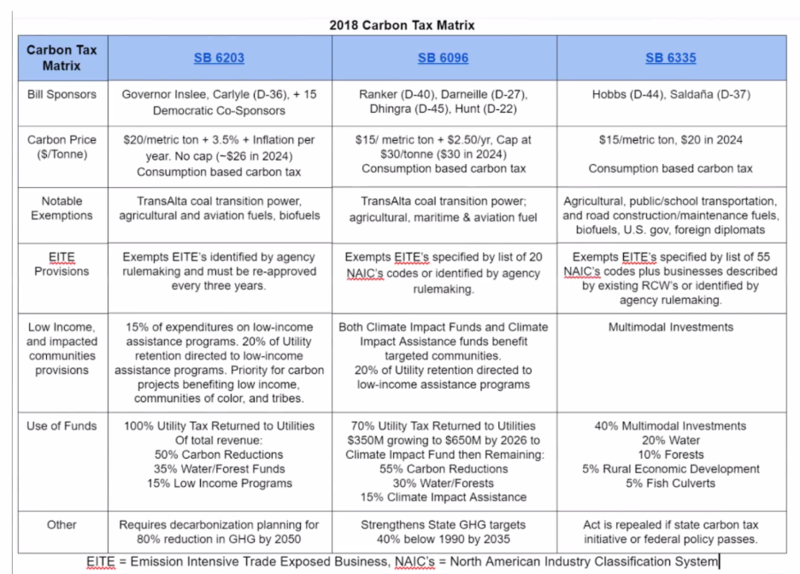 ACT NOW (Advocates for a Carbon Tax NOW) is a growing coalition of volunteers and more than 30 organizations including Carbon Washington, Audubon Washington, Citizens’ Climate Lobby (CCL), League of Women Voters, American Sustainable Business Council, Conservatives for Environmental Reform, and others that want to see a carbon tax pass here in Washington State. Thank Governor Inslee for his thoughtful proposal. This bill contains the right framework for effective state-level climate policy: it makes polluters pay, invests in clean energy, water and healthy forests, and it helps make sure low-income communities aren’t left behind. Also, if the legislative session, which ends March 8th, doesn’t result in the passage of this bill the Alliance for Jobs and Clean Energy will develop an initiative for the ballot in Nov.
Can Gov. 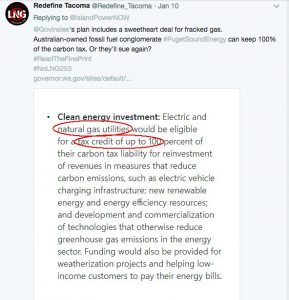 Inslee deliver America’s first carbon tax? Sounds good on the surface but is silent on nuclear energy. While I completely support the goal of a 100% clean energy future, that future should not include nuclear. 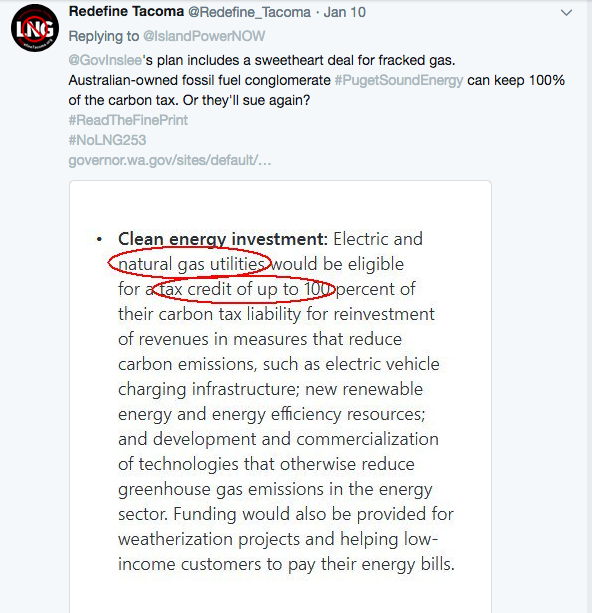 Also, the bill does not do enough to promote energy efficiency, and the bill’s target date of 2045 is too far into the future considering the urgency of the climate crisis. During SB 6253’s January 23 public hearing of the Senate Energy, Environment & Technology Committee, its neutral stance on nuclear energy was roundly debated, with some utility providers say the carbon-free goal by 2045 could cost billions to attempt but is not attainable in that timeframe.“I know it’s a sincere goal … the question is, is it a realistic goal?” said Tim Boyd, a lobbyist for Industrial Customers of Northwest Utilities, a nonprofit organization.If passed, the bill would set a timetable for public and private utility providers to eliminate electricity produced by coal and natural gas in favor of “carbon-free” energy, defined as a “resource that emits no greenhouse gas pollution as part of its generation activity” or is “a renewable resource.” That includes energy generated by hydro, wind, solar and nuclear power.Citing the state’s recent wildfire seasons and hurricanes in other parts of the country, sponsor Sen. Kevin Ranker (D-40) described the bill as “beginning the conversation we must have…to move us toward a carbon-free future. 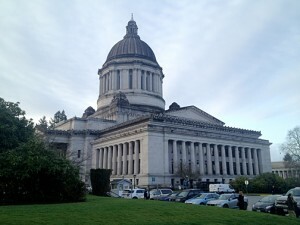 The public hearing was preceded by a gathering the day prior of environmental activists and lawmakers backing climate change-legislation, including Governor Jay Inslee. “A zero-carbon future by 2045 is a laudable goal,” Boyd said. However, he added that it’s not attainable within the next 20 years unless new technology is developed. That was the conclusion of the Northwest Power and Conservation Council’s 2016 Seventh Power Plan. No further action is scheduled for the bill. ADDENDUM: Bill is not completely dead. If there is a majority of the members of the committee who will vote yes to pass it out of committee, they need to tell the chair they want it out. nothing is dead until the session is over, not matter what they tell you, nothing. votes can move dead bills. This bill is about reducing the greenhouse gas emissions associated with transportation fuels. All of the nonprofits associated with Climate Lobby Day like this bill as well as Sierra Club because it would finally undo the poison pill included by Senate Republicans in the 2015 transportation funding package.